Goat meat is the most popular of all variants of red meat consumed worldwide, it accounts for 65% of the total red meat consumed all over the world. Many countries in North Africa, the Middle East, and South Asia consume goat meat as a staple food choice. Goat meat is the most popular of all variants of red meat consumed worldwide, it accounts for 65% of the total red meat consumed all over the world. Many countries in North Africa, the Middle East, and South Asia consume goat meat as a staple food choice. It is also a popular choice of meat in the Caribbean and tropical regions. Goat meat is a rich source of proteins which helps in maintaining muscular health. The essential amino acid profile of goat meat resembles that of chicken, beef and pork. Since goat meat is lean meat, it provides all the essential amino acids without adding up unnecessary calories, unlike other sources of meat. The total calories associated with consumption of 100 g of goat meat are 122; whereas the same portion of chicken has 162 calories, beef 178 calories, and pork 180 calories. Therefore, consuming goat meat helps in regulating weight and prevents obesity. Goat meat also reduces the risk of developing type 2 diabetes and cardiovascular diseases that are associated with obesity. The total amount of cholesterol present in 100 gram of goat meat is less than 1 gram. Unlike other meats goat meat has low saturated fat and high unsaturated fat values. According to the Harvard School of Public Health consuming low cholesterol reduces the risk of developing heart disease, such as coronary artery disease and atherosclerosis. The consumption of unsaturated fats increases the level of HDL (good cholesterol) in blood, essential for a healthy heart. Goat meat is rich in dietary potassium; 100 g of goat meat has about 385 mg of potassium. The potassium content of goat meat is good for maintaining correct blood pressure. Potassium has a role in stabilizing heart rhythms too. Hence, it reduces the risk of developing rhythm disorders of the heart. Goat meat is low in sodium content when compared to chicken and beef. 100 gram of goat meat has only 82 mg of sodium. Therefore, consuming goat meat reduces the risk of developing hypertension. According to guidelines by the US Department of Health and Human Services in 2010, the dietary intake of sodium should not exceed 2,300 mg in a day. A high level of sodium in blood can cause hypertension (high blood pressure). Goat meat is a red meat, which means that it has high myoglobin content. Meats rich in myoglobin offers a higher level of dietary iron and improve blood health. There are about 3 mg of dietary iron present in 100 g of goat meat. Goat meat can reduce the risk of developing iron deficiency anemia. 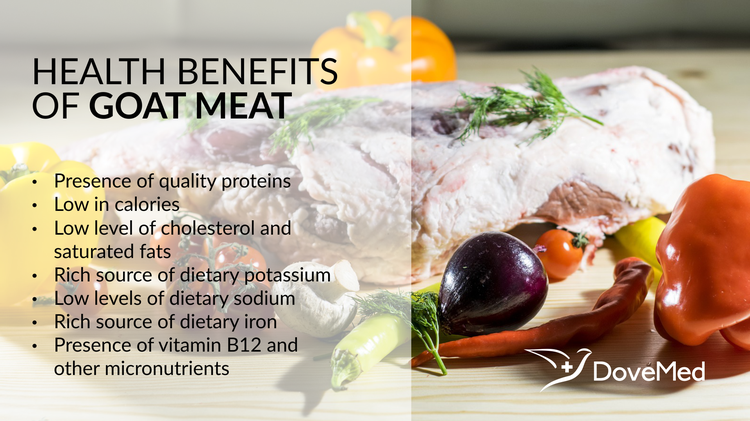 Goat meat has micronutrients, such as vitamin B12, selenium, and choline, which are powerful antioxidants that reduce the risk of developing cancers. Hence, goat meat is a known source of lean protein. There are many health benefits associated with its consumption. Due to these factors, goat meat is gaining popularity in Europe and America too. Mahgoub, O., Kadim, İ. T., & Webb, E. (2012). Goat meat production and quality. Cabi. Pearce, K. L., Norman, H. C., & Hopkins, D. L. (2010). The role of saltbush-based pasture systems for the production of high quality sheep and goat meat. Small Ruminant Research, 91(1), 29-38. Madruga, M. S., & Bressan, M. C. (2011). Goat meats: Description, rational use, certification, processing and technological developments. Small Ruminant Research, 98(1-3), 39-45. Webb, E. C. (2014). Goat meat production, composition, and quality. Animal Frontiers, 4(4), 33-37.